To cater to this particular need, a number of industrial and armament grade fluid and dry lubricants are available in the marketplace. Of these, there are many which are preferred as lubricants for application in the pivots of folding knives for smooth blade deployment. Nano-Oil knife lubricant is one such new lubricant that uses nanotechnology to provide high quality industrial grade lubrication. It falls in the category of the more expensive commercially available lubricating oils that are commonly used by knife enthusiasts. But most users agree that despite the cost its a good value for the money and delivers what it promises. Nano-Oil is a lubricant created by Christian StClaire and produced in the USA that uses Nano-Bearings to withstand high pressure and varying temperatures. There is some misunderstanding regarding what a “nano oil” is. Nano oils do not contain diamond nano balls, but instead carbon nano balls called Buckminsterfullerene (or Buckyballs). These nano balls (called Nano-Bearings in industry jargon) are extremely small, under 0.090 microns. To put the size in perspective, a single human hair measures in between 50 micron and 100 micron wide. The bond between the carbon atoms in these nano ball bearings is very strong. So strong that they cannot break down under high heat and high pressures. This is why lubricants containing these carbon nano bearings are so useful in industrial applications where there is a lot of friction creating high heat when machine parts continuously rub against each other. How Does Nano-Oil Work On Knives? When Nano Oil is applied to a metal surface, the tiny ball bearings can get into every single crevice, no matter how fine, on the surface of the metal. A single square millimeter surface of the metal on which the oil has been applied can have 50 million carbon ball bearings slipping into all the cracks and fine, invisible crevices that need lubricating. In the case of folding knives, the place at the pivot where the two metal surfaces rub against each other can become galled. Galling or chafing results in gouging or deep scoring of the metal surfaces. Eventually the pivot of the knife can end up not functioning as it should. Oiling will reduce wear and keep the knife performing at full potential for a long time. Besides reducing wear, oiling the springs and joints of stainless steel folding knives also helps to prevent rust. Modern knife steels are usually very high quality material, but time and use can still lead to corrosion. Stainless steels are rust resistant, not rust proof. Using oil to prevent rusting is particularly important if you live close to the ocean or in a damp climate. Of all the lubricants and synthetic oils I have tried on my knives Nano-Oil consistently provides the smoothest blade deployment. This stuff works so well I can actually tighten the pivots of most knives and still have a smooth opening and closing blade. Extremely helpful if you have a knife that exhibits blade play if not fully tightened, but when tight becomes hard to open. You would normally have to find a sweet spot in the pivot that will ultimately give you less than adequate blade lockup and deployment performance. Or you could just apply a few small drops of Nano-Oil and tighten the pivot. Chances are good it will allow you to have a smoother knife with no blade play. In order to stave off rust and discoloring you can rub the Nano-Oil on the blade of the knife with a piece of cloth, though honestly as much as it cost I would recommend using a cheaper solution since this will require quite a bit more than the few drops used on the pivot. If the knife has come into contact with corrosive elements such as salt water you should thoroughly rinse the knife with plain water and apply a layer of oil. What the this will do is help prevent the salt or moisture in the air from coming in contact with the blade. If you live in a damp climate you should always keep your knife blade oiled with a thin layer of lubricant with rust preventative properties. The pivots and springs should also be oiled with Nano-Oil to prevent rust and improve performance. 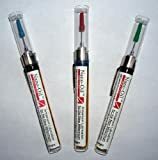 I found it to be a big convenience that Nano-Oil tubes come with fine, needle-like tip applicators that make it easy to dot a few drops into hard to reach places in the pivot or springs without the need to completely disassemble the knife. Stiff knives can become smooth with as little as a couple drops of the oil – one on each side of the pivot applied directly between the blade and washer. Nano-Oil quickly evaporates after application, leaving behind microscopic ball bearings and no greasy residue. It also doesn’t smell as badly as some other lubricants, an issue I had with Tuf-Glide. These features of the oil make it suitable for all types of lubricating jobs around the house. Nano-Oil is available in several strengths: 5 weight, 10 weight and 85 weight, depending on viscosity. 5 weight Nano Oil is lightest and evaporates quickest. Most knife users have found 10 weight Nano-Oil the most suitable for knife maintenance and other equipment like fishing reels, door hinges, guns, flashlight threads and other gear where friction is created from direct metal on metal contact.